I know it's been awhile since I did a book review and this actually isn't one that I wanted to do, but one that I have finally accepted that I needed to do. So today we are going to take a look at John Matthews 2005 book 'The Secret Lives of Elves & Faeries'. I will preface this review with two things: I have no personal issues with Matthews work in general and have often used his Druid Source Book and Seers Source Book as references; and I am going to focus this review on the issues I have with this work being marketed as nonfiction and why I believe it is actually fiction. I do not dispute that people may, and indeed probably do, find inspiration and value in this book but I think it is vitally important to understand it in the context of fiction rather than as historic truth, such as that may be. Once again we see a book marketed primarily to a pagan audience that takes the track of being newly revealed material found in a heretofore undiscovered historic text, in this case the alleged personal journal of Rev. 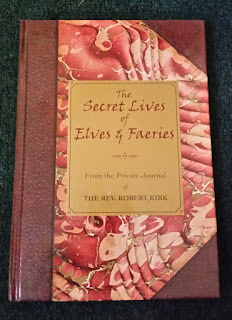 Robert Kirk author of the 17th century work 'The Secret Commonwealth of Elves, Fauns, and Fairies'. There should be some immediate red flags with this, even for people unfamiliar with other authors like Douglas Monroe and Steven Akins who have tried this same line to sell their books. First of all such a personal journal if it existed would rightly belong to a museum, university or library - indeed the existing manuscripts for 'The Secret Commonwealth' can be found today in the University of Edinburgh Library and National Library of Scotland. Secondly, as was touched on in point one by my mention of two locations for his real books, despite modern views of the idea of journaling Kirk's actual book was written in a series of tiny journals not one single large book (Manwaring, 2017). That aside however it should be noted that had a new and previously unknown journal belonging to reverend Kirk been found it would have made headlines and been the subject of significant academic study. In contrast this book was apparently only seen by Matthews, never seen again afterwards, and never mentioned or written about by anyone else in the last 12 years. During the period when Matthews claims this private journal was written and Kirk was off adventuring with fairies and exploring the subterranean world Kirk was actually confined to a sick bed for the most part and was dictating 'The Secret Commonwealth' to his cousin Robert Campbell (Manwaring, 2017). This means that Kirk, while able to get out and take short walks near his home would have been physically incapable of the lengthy explorations depicted in Matthews book, which are clearly established as physical and not spiritual journeys and occured right up to the point of Kirk's death or alleged disappearance*. This also calls into question the premise of Matthews book, that The Secret Commonwealth was excerpted from Kirk's personal journal material aka The Secret Lives, since we know that The Secret Commonwealth as we have it is at least partially from dictated material and was otherwise pieced together from material found in several different journals, rather than from a single manuscript. The Sidhe, page 22: "We are an ancient people. We were here long before your kind walked on this earth. We remember everything and have seen everything that took place here for many thousands of your years. We do not measure time as you do, so that for us time passes slowly. We do not speak of our origins to anyone not of our race; but it is certain that we emerged from the earth as you yourselves did, though much sooner in the history of the world." The Secret Lives of Elves & Faeries: "We are an ancient people." Kee told me. "We were here long before your kind walked on this earth. We remember everything and have seen everything that took place here for many thousands of your years. We do not measure time as you do, so that for us time passes slowly. We do not speak of our origins to anyone not of our race; but it is certain that we emerged from the earth as you yourselves did, though much sooner in the history of the world." 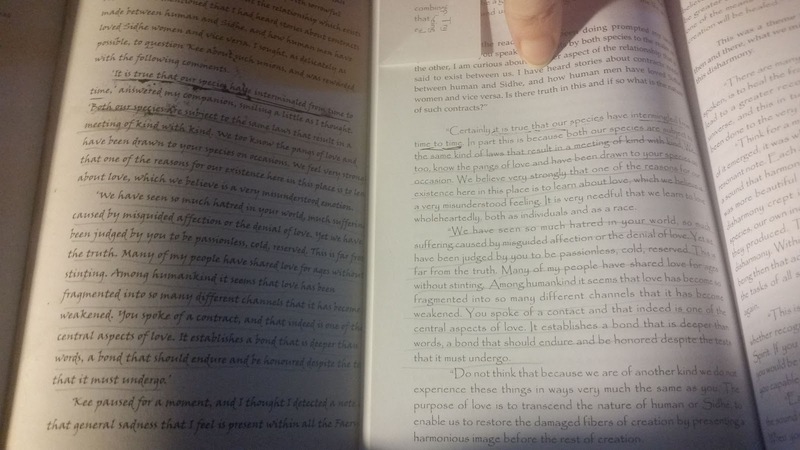 For anyone interested the doubled text that I have personally noted can be found in these places: The Sidhe (TS) page 22-23, 3 paragraphs duplicated in Secret Lives (SL) on pages 32 - 33. TS page 23 1 paragraph duplicated in SL page 34. TS page 52, 3 paragraphs doubled in SL on page 61. I realize that some people may immediately respond to this by arguing that perhaps Matthews and Kirk were told the same things. I would personally have some arguments against that idea, but taking it as is for the moment even if we assumed it was true it would not result in this amount of duplicated text. Reverend Kirk writing in the 1690's was not writing in modern English as Matthews is, and as anyone familiar with Kirk's Secret Commonwealth may realize the language Kirk wrote in is not always easily read by modern English speakers. It is early modern English mixed with a language called Scots, and looks like this: "Ther Women are said to Spine very fine, to Dy, to Tossue, and Embroyder: but whither it is as manuall Operation of substantiall refined Stuffs, with apt and solid Instruments, or only curious Cob-webs, impalpable Rainbows, and a fantastic Imitation of the Actions of more terrestricall Mortalls, since it transcended all" (Kirk & Lang, 1893). Even if we assume that the message the two men received was the same the way they each recorded it, more than three hundred years apart, would have been radically different. Relating to that last point, the language issue. 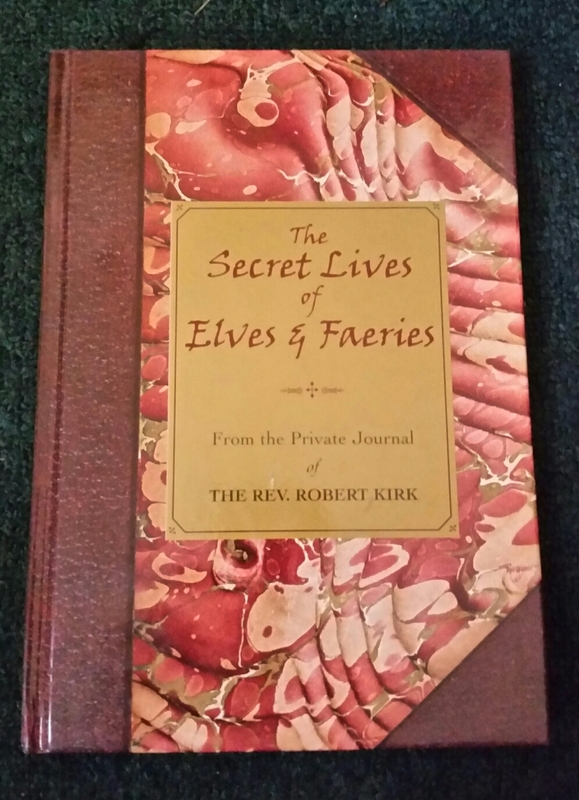 Secret Lives of Elves & Faeries is labeled clearly as Reverend Kirk's personal journal, and opens with a story by Matthews about how he found this journal and came to publish it. And yet the book in several places misuses words and terms from Gaidhlig and Scots that Kirk would have been fluently familiar with**. Even if we account for Matthews supposedly translating the text and updating the language it would not excuse these errors. In modern Gaidhlig the fairy folk are called sithe and in Secret Commonwealth Kirk refers to them as sith. In Secret Lives Matthews has Kirk calling them by the Irish term 'sidhe'. At one point in Secret Lives Matthews has Kirk telling a story in which Kirk's fairy friend Kee incorrectly uses the Scots word foyson as a verb when it is a noun. In another place the Unseelie use the Gaidhlig term 'sluagh' as a nickname of sorts for Kirk, even though sluagh is a collective noun that means 'assembly, folk, people'; while Matthews offers the in-text explanation, allegedly from Kirk, that says sluagh is a term for a dead human who won't pass on, this is a fabrication. The Unseelie calling Kirk sluagh is like them nicknaming him 'crowd'. All of these are also red flags that the person writing the text wasn't familiar with or fluent in these languages, and make it impossible for it to be the writing of a man who spoke both languages. In The Secret Commonwealth Robert Kirk never mentions there being two courts. This is because we don't see any references to the Unseelie Court prior to the 19th century. Before that the fairies were referred to only by the term Seelie Court, which was used as a euphemism more than a descriptor of an actual court. In contrast Matthews book is very much based on the idea of there being two courts, and of one court being benevolent and the other malicious. Even this ignores the folklore that warns of the dangers presented by the Seelie Court, but that aside it is at best a glaring anachronism to see the Unseelie Court mentioned in a book allegedly written hundreds of years before that concept was known to exist. The final thing I may note is simply a matter of history. Kirk's Secret Commonwealth was a book written from the perspective of a folklorist recording native beliefs and carefully framed in a strongly Christian worldview. Matthews Secret Lives in contrast paints a picture of a man who was deeply personally involved with the fairy folk and was avidly writing down his personal experiences with the idea of sharing what he was writing with family and perhaps even a wider audience. During Kirk's lifetime in the area of Scotland he lived in people - men and women - were being persecuted and executed for practicing witchcraft on the basis of associating with fairies. Had Kirk actually written such a text and had it been discovered, minister or not, he would have faced trial and execution as did others like Andro Man and Betsy Dunlop, a fact that Kirk would have known. Such a journal would have been a death sentence, and while it suits our romantic modern notions to imagine such a thing the living Kirk would never have been foolish enough to write about his desire to share his experiences and writings with his family. People died for such things. Ultimately people may find The Secret Lives of Elves & Faeries to be fulfilling and even inspiring. They may enjoy the vision Matthews paints of Fairy, his weaving together of some of Kirk's material from The Secret Commonwealth and well known folklore like the story of the Stolen Bride or Borrowed Midwife with his own ideas and material. But any reader must understand this book in its context as fiction, which it does not admit to being. To fall into the trap of seeing this as what it isn't, as the actual writing of Reverend Kirk, is highly problematic and does a disservice I think to Kirk's actual writing and to the older folklore. For myself when I'm in the mood for fiction centered on rev. Kirk I'll stick to Kevan Manwaring's book 'The Knowing' which is both honest about its nature and an excellent novel full of genuine fairylore. For a great scholarly look at Kirk's book I highly recommend Brian Walsh's book 'The Secret Commonwealth and the Fairy Belief Complex'. *I'm actually in the camp that does believe that Kirk was taken by the Sithe as his body was found dead near the fairy howe (hollow). This is, of course, disputed in different sources and there is a great deal of folklore around Robert Kirk's death or possible disappearance. **Kirk had translated the Bible and psalms into Gaidhlig. I was always under the assumption it was a work of fiction. But I did see the reviews on Amazon blasting the work as they thought it was real. Well, nowhere does it say that it is fiction. On the cover it says very clearly that it's 'from the private journal of reverend Robert Kirk' and inside its says in multiple places that it is Kirk's personal journal, found and presented in print by John Matthews. So its understandable that many people believe that it is in fact what it says it is. Part of what motivated me to finally write this review is the number of people over the last few years that I have run across who repeat things from this book and cite 'Rev. Kirk' as their source, or who talk about Kirk being taken by the Unseelie Court specifically for offending them. I have no issue with anyone choosing to believe what they want, but people should know when a book advertising itself as non-fiction is in fact not what it claims to be. So.